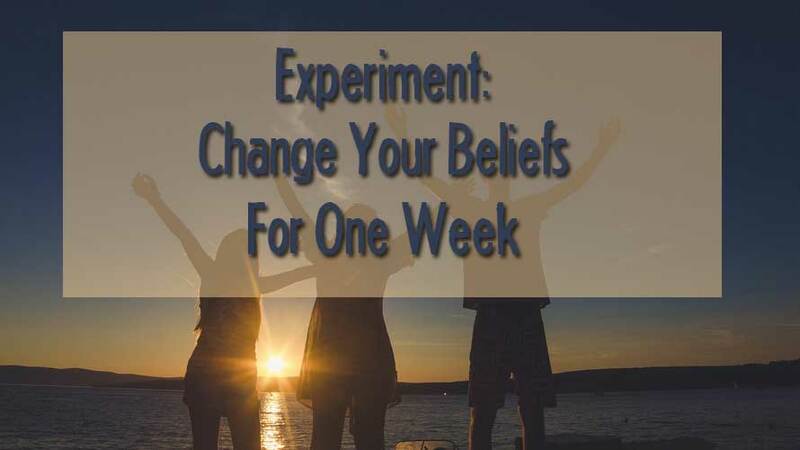 Experiment: Change Your Beliefs For One Week - Better Believe It! Today’s article is a short one, but it’s a powerful one. 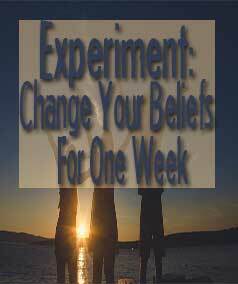 It’s just an experiment for you to do for 7 days. It’s based on the premise that the world as we see it is based on what you believe (a common point here). 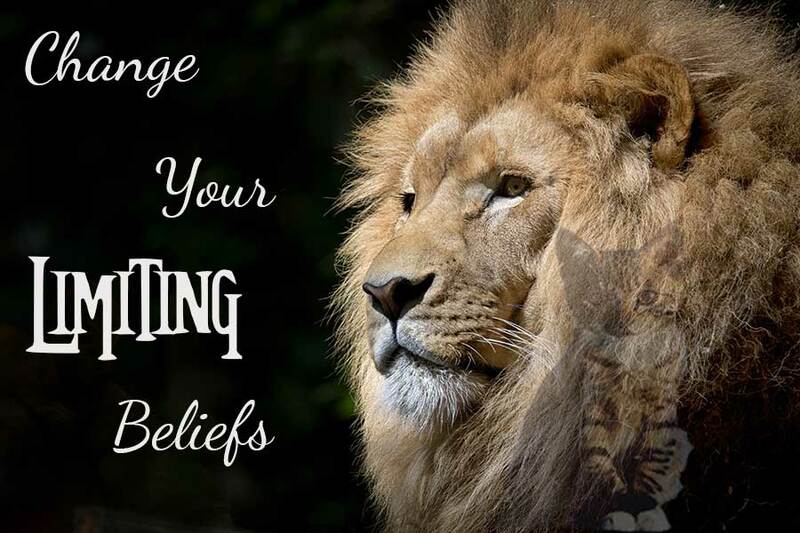 Change your belief, and you change your world. You don’t have to do it permanently, but why not try it for 7 days and just see if anything changes? Think about all the “what if’s” that float into your mind on any given day. I’d be willing to bet that the majority of those thoughts are about something negative happening, instead of something great happening. I always have trouble sleeping. I’ve always been poor, and I’ll probably always be poor. I’m not comfortable in groups of people. I’m terrible at speaking in front of people. I’ve never been good at relationships. I can’t ever find a good job. Everyone has stories that you use to define yourself, or things that you believe to be true. But the fact is, the opposite can also be true. It all depends on what you notice, or pay attention to. When you believe one thing, you often only see those things that support that belief; meanwhile you ignore all the other things that lend proof to the opposite belief being true. So for this experiment, I want you to write down 1-3 beliefs that you hold that you feel are holding you back from leading an exceptional life. Now write down the opposite of that belief. For one week, read your new belief as soon as you wake up each morning, and remind yourself of it periodically throughout the day. 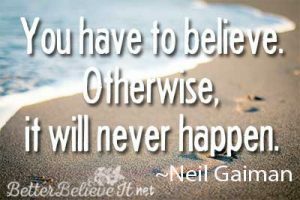 Try to notice things that occur that support your “new’ belief and jot it down. At the end of 7 days, review the results of your experiment. Wasn’t the opposite belief also true? Did you find evidence that supports the new belief? 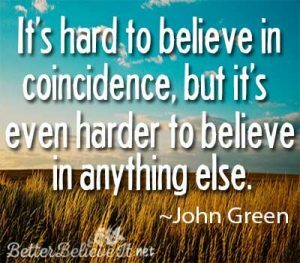 Within the first week of doing this belief-reversal experiment, an old friend who I hadn’t had been in contact with for 15 years contacted me. Immediately, we picked up right where we left off 15 years ago – really good friends – always talking, texting, chatting, having fun. It turns out this friend got a really good job and was earning quite a substantial sum of money. In one of our conversations, the subject of how I was really buried under an expensive credit card bill came up. Most of the money I pay on that every month goes to interest, instead of paying what I owe on it. Without me even asking, my friend offered to pay off the credit card, then I would just pay him back what I owed – without the interest. And the payments would be what I could afford. This was totally unexpected – and a huge relief. I told him about this business I wanted to start (selling on amazon). He wanted to help me by paying for the initial merchandise. Then, when I sold the items, he just wanted his investment back (but any profit would be mine to keep). The biggest hurdle of me starting my own little online business had a solution thanks to this unexpected generosity! The only other thing that happened that first week had to do with my bank account. I meticulously track all of my income/outgo in a paper notebook. According to my records, my bank account balance was $112.00. I don’t know how, but somewhere I must have miscalculated something somewhere because on Friday, I logged into online banking and my account balance was $382.00. I checked and double-checked. Everything was accounted for (no outstanding debits waiting to come in), but somehow the balance was $270.00 more than I thought it was. So that was an unexpected surprise. This experiment reminds me of something that happened to me in June of 2003. I remember it because it was so out of the ordinary. At that time, I was a single mother of 3 small children, and I was flat broke. I could barely pay the rent and utility bills, let alone afford groceries. I had 3 little kids who always wanted toys, yet I never had any money to buy them any gifts, treats, or toys. One day, I got so fed up with not having anything and always having to tell my kids, “No, I can’t afford it”. So I told them, “Today, we are going to act like we’re rich”. So we all dressed up in our fanciest clothes. We paraded around the house using fancy British accents, saying things like, “Go tell the butler that I would like my afternoon tea now”. Then I said to them, “Let’s go to Walmart and buy lots of gifts for all our servants and gardeners and household staff”. (I know – Walmart – where rich people shop, huh?!) They loved the idea. So in our fancy clothes, we went to Walmart. Each of us grabbed our own cart. We walked through the store (still using our fancy accents), choosing expensive items, saying “I think I’ll buy this for the chef” and “The gardener would just love this!”. Of course, we couldn’t actually buy any of it, but we were all having a great time. Weird things happened that day. While at Walmart, my oldest daughter had to go to the bathroom. When I took her into the stall, I found a $20 bill laying on the floor. I was so ecstatic. When we were done “shopping”, I grabbed a few quarters so they could play a couple of the games at the fun place at the front of the store. My middle daughter went to use the claw machine (where you move the claw and try to grab a plush toy), but the machine malfunctioned. After she put in her 2 quarters, it didn’t shut off. She kept playing – moving the claw, pressing the button – over and over and over again. She played 13 times even though she only paid once. And on her last try, she got a toy. Then we went outside, and my youngest boy wanted to ride the ride-able truck out front (like those horses that rock back and forth, but this was a Walmart truck). I set him in it, and when I went to put the quarter in, I saw that there were 4 quarters sitting in the coin return slot. So he got to ride 4 times – for free. When we got home from Walmart, some anonymous person had left 2 bags of groceries sitting in front of my front door. That had never, ever happened to me before. There was no note, and I never did find out who did that. None of these things might be a big deal to anyone else, but it was a huge deal to us. I had $20 in my pocket, when every dollar I had went to either bills or food for over a year. $20 extra dollars was HUGE. Free fun for the kids was amazing. 2 bags of groceries from an anonymous donor when we sorely needed it was a Godsend. And walking around all day feeling like we were rich, laughing, and having fun was such a bright spot in a really long, dreary, dark time. I still wonder to this day if those gifts we got that day came because my attitude that day was one of joy and abundance instead of my usual mindset of lack. It could have been just a strange coincidence, but I think I’d rather believe that it happened because of my beliefs and attitude that day. 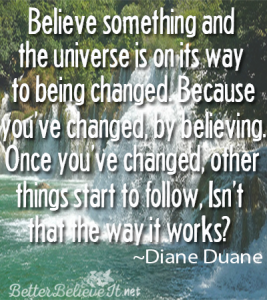 So why don’t you just try changing one belief you hold dear for a week and just see what happens? It doesn’t have to be about money. It doesn’t even have to be about anything big or major. Just think about one thing (or 2 or 3) you believe, and think about how, if the opposite were true, how your life would be a little better. Then commit to believing the opposite of that for 7 days. Then come back here and share your experience in the comments below.